New building, with a very small season pool and a solarium in the roof. Balcony facing the street with trees all around. There are two twins that can be made a Queen and also a sofa-bed. All the furniture incuding beds, sofa, linen and towells is new as it is the flat . 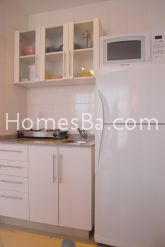 Round glass table, kitchenette with fridge with freezer, tow electric range, microwave with grill. Complete bathroom with bathtub. Hair dryer, iron. 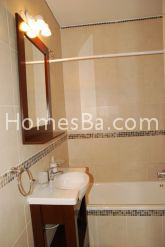 Near to: Restaurants, Stores, Bus Stop, Coffee Stores, University, Hospitals.